Mold, mildew or other staining substances can make yellow stains on your home's wall panels. This often happens when a home floods and water runs down the wall. 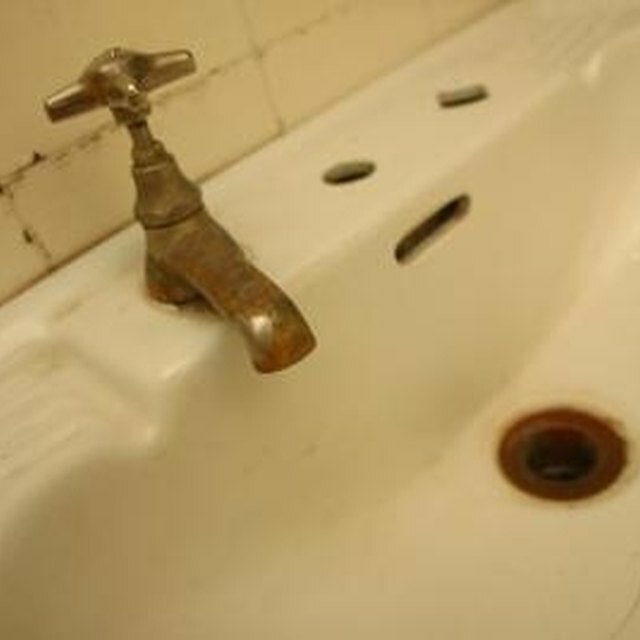 The water may be from rusty pipes that will tint it yellow, or it will leave a damp mark that will attract mold or mildew. You can remove these stains on your own if the wall in still intact. If the wall is decayed, you will need to replace it. Fix the source of the stain before cleaning the stain by fixing leaks and removing rust from leaking pipes. Otherwise, the stain will eventually return. Mix 4 cups warm water with 1 tsp. liquid dish soap in a bucket. Apply the soapy solution to the walls with a clean sponge. Scrub the wall gently with the sponge until it is completely clean. Wipe up the soapy solution with paper towels. The yellow stains may be gone if they were slight or were not on the wall for long. Mix 1 cup bleach with 1 gallon water in the bucket. The bleach will soak into the wall to remove the stain. Apply the bleach solution to the walls with a clean sponge. Let the solution sit on the walls for at least 10 minutes to give it time to loosen the stain. Scrub the walls with a soft-bristled brush until you've removed all of the yellow stain. Repeat the bleach process if the stain is still visible. Rinse the walls with a sponge soaked in clear water. Dry the walls thoroughly with paper towels.